Minnesota requires 15 hours of continuing education every two years. 9 of the hours must be in the following areas: body preparation, care, or handling, 3 CE hours; professional practices, 3 CE hours; regulation and ethics, 3 CE hours. All licensed morticians who currently have an active mortuary science license ending with an odd number are required to obtain continuing education credits during each odd year renewal cycle (2015, 2017, etc.) 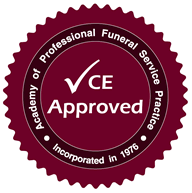 All licensed morticians who currently have an active mortuary science license ending with an even number are required to obtain continuing education credits during each even year renewal cycle (2016, 2018, etc.) For example, license number M-1234 must obtain CE credits prior to renewing in December of 2015 for license year 2016. The following courses have been approved by the Minnesota Department of Health Mortuary Science Section. Course category assignments can be viewed here.